Born in 1977, CasiraghiTrio is now a professional student, researcher, and writer. She traveled and studied far and wide before resettling in her hometown of Burbank, California. In the years following the death of Diana Princess of Wales, former employees, friends, and journalists have been busy publishing increasingly scandalous and lurid accounts of her life. This article is a plea for tolerance and moderation in media coverage of Diana and a celebration of her positive contributions to charity and family. Indeed. Just Diana. The wonderful, loving, beautiful, gracious Just Diana. Anyone who calls "Di-mania a disaster need only remember the work she did. Prince Charles once told Ingrid Seward that anything that raises over a million poinds for charity can never be called "disastrous." He said it in answer to her statement that the It’s a Royal Knockout television show in the 1980s had been a “disaster” for the monarchy, but his words could easily be used in reference to his first wife's tireless work on behalf of her charities.1 While she was HRH The Princess of Wales, Diana succeeded in turning the media floodlight on many previously obscure charities, such as Help the Aged, Birthright, Turning Point, Headway, the Malcolm Sargent Cancer Fund for Children, and Barnardo's. Those charities, however, lost her as their royal patron following her divorce. She retained only six patronages after that time: Centrepoint, The Leprosy Mission, the National AIDS Trust, the English National Ballet, the Great Ormond Street Hospital, and the Royal Marsden Hospital. Diana was a British Red Cross patron during her marriage and continued working for the British and International Red Cross after the divorce. She attended Red Cross conventions in Geneva and most famously helped focus attention on the British Red Cross campaign to ban anti-personnel landmines. Diana's work lives on, despite her physical absence. Her mark is stamped all over her son Prince Harry’s founding patronage of Sentebale, which benefits children and babies with AIDS/HIV. This year Prince William took over the presidency of the Royal Marsden Hospital, which was one of the beneficiaries of Diana’s Sale of Dresses at Christie’s auction house. Prince William also visited Centrepoint Safe Shop in December 2006. Diana used to take Prince William and Prince Harry to meet homeless people at Centrepoint shelters, where they helped serve breakfast and sat down for tea with the residents.5 In the week following Diana's death, Canadian students raised money for the Red Cross by wearing black ribbons with red hearts - a tribute to the woman being hailed as “Queen of Hearts”, “Queen in People’s Hearts,” or “The People’s Princess. "6 The Concert for Diana on 1 July 2007, the day she would have turned 46, benefited the Leprosy Mission, Centrepoint, and Sentebale, as well as her namesake memorial fund.7 The Diana Princess of Wales Memorial Fund now has a revised strategy and fresh management. No longer “criteria-led,” the Fund focuses on what it calls a “pro-active and objective-driven” course,8 in a drive to seek out obscure and difficult causes. This objective, cited in the Fund's official website, is rather in the spirit of Diana the person, who took pride in being a champion of causes either unknown or controversial. One private trouble is worth noting, however. Diana’s battle with bulimia nervosa for most of her adult life helped bring this debilitating disease into the open. Its many symptoms include hair loss, dental problems, and fatigue; left untreated, it can be fatal. It affects as many as 4% of women and about one-tenth as many men.9 The causes of bulimia are interlaced deeply with emotional insecurities and poor self-esteem. Bulimia, much like its sister disease anorexia, causes its sufferers to feel shame and a compulsive need to hide the binges and purges. This need for secrecy is powerfully challenged when a high-profile person like Diana admits to being a sufferer. Diana’s friend Carolyn Bartholomew threatened to reveal Diana’s bulimia to the press unless she sought treatment. Threatened with exposure of what felt like a dirty and shameful secret, Diana agreed to see a psychiatrist who specialized in eating disorders, and eventually she felt able to speak out in public about her experiences.10 For many bulimics who have felt freakish and disgusting because of the disease, Diana’s confession must have been reassuring. In spite of the private travails and misguided actions that kept the tabloids busy and made the paparazzi rich, what stands out more than anything in the life of Diana is her humanity. Her brother characterized her as "the very essence of compassion, of duty, of style, of beauty...the unique, the complex, the extraordinary and irreplaceable Diana. "11 Lord Spencer's most memorable tribute to his sister needs no expansion, but I might add just one attribute: the Diana to whom everyone, everywhere, of every age could relate. Whether it was the young and innocent bride, the troubled royal novice, or the seasoned and sophisticated humanitarian, there was something for everyone to relate to. This goes beyond saying she was a ''People's Princess"12 or a ''Queen in people's hearts. "13 With every tear and every laugh, she was the princess in all of us. 1. See Ingrid Seward’s book The Queen and Di, page 171. ISBN: 1559705612. 2. The groups with which the Princess of Wales ceased to be involved in 1996 are listed at http://www.bbc.co.uk/politics97/diana/charlist.html. 9. The statistics here are from the Mayo Clinic and Anred websites. 13. Diana, Princess of Wales, on Panorama, November 1995, in interview with Martin Bashir. 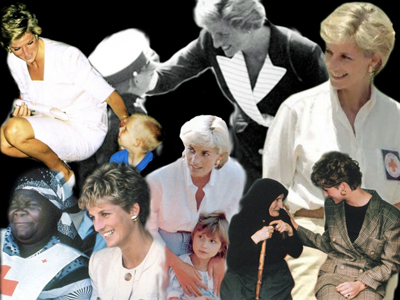 Photo collage of Diana by The Royal Forums member TheTruth and used with permission.